1) (South Carolina, bart.). Sa. a chev. engr. ar. betw. three fleurs-de-lis or, on a chief of the last, as many spearheads ppr. a border wavy erm. Crest—On a mount vert and within an annulet, or, a dragon’s head couped at the neck ar. semee of annulets sa. and murally gorged gu. Motto—Mens sibi conscia recti. 2) (Gayhurst, co. Buckingham; descended from the Rev. Ezekiel Wright D.D., younger brother of Nathan Wright, of Cranham, co. Essex, father of Sir Benjamin Wright, first bart. of Cranham; Anna Barbara Wright, only child and heiress of George Wright, Esq., of Gayhurst, dying unm. 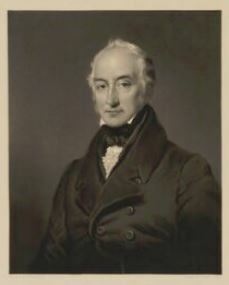 In 1830, the estate and representation of the family devolved upon her consin, George Thomas Wright-Wyndham. Esq., of Cromer, co. Norfolk, who d. in minority. He was the son and heir of John Wyndham, Esq., of Cromer, and his wife, Elizabeth Dalton, only surviving child of Mary Wright, wife of Richard Dalton Esq., and elder dau. 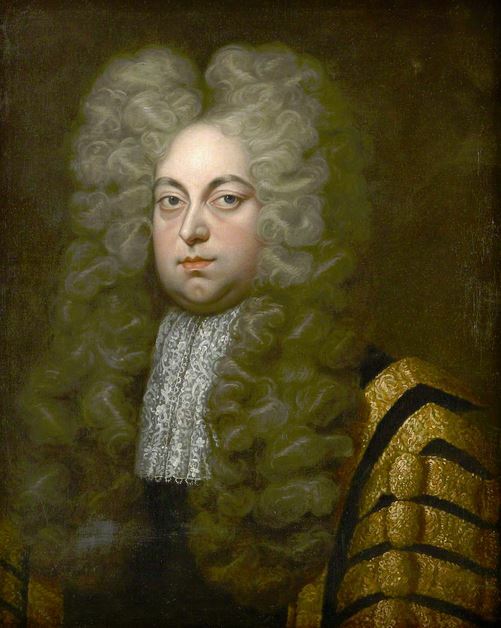 of George Wright, Esq., of Gayhurst, soil and heir of the Lord Keeper, Sir Nathan Wright). Az. two bars ar. in chief three leopards’ heads or. 3) (Bickley, co. Chester; confirmed 18 Dec. 1583). Ar. two bars az. on a chief of the last three leopards’ faces of the first. Crest—A dexter arm embowed, habited az. holding in the hand ppr. a sword, point downwards ar. hilt and pommel or, enfiled with a leopard’s face as in the arms. Another Crest—A leopard’s face ar. 4) (Mottram St. Andrew, co. Chester; descended from Thomas Wright, of Nantwich, living temp. Henry VIII.). Sa. a chev. ar. betw. three bulls’ heads cabossed of the second. Crest—Out of a ducal coronet or, a bull’s head ar. attired of the first. 5) (Mottram Hall, co. Chester; exemplified to Captain James Frederick Darley Street, who assumed, by royal licence, 1805, the surname and arms of Wright on his marriage with Julia Catherine, dau. and co-heiress of Rev. Henry Wright, of Mottram Hall). Quarterly, 1st and 4th, sa. on a chev. betw. three bulls’ heads cabossed ar. a crescent betw. two crosses crosslet gu. and, for distinction, in the centre chief point a cross crosslet or, for Wright; 2nd and 3rd, or, a cross parted and fretttfe gu. betw. in the 1st and 4th quarters three martlets, and in the 2nd and 3rd as many annulets sa., for Street. Crests— 1st, Wright: A bull’s bead ar. erased sa. ducally gorged gu. and charged on the neck for distinction with a cross crosslet also gu. ; 2nd, Street: A demi man in armour ppr. his breastplate charged with a cross, as in the arms, and supporting with his dexter hand a flagstaff, therefrom flowing to the dexter a banner gu. charged with an annulet or. Mottoes—Wright: Suhlimiora quaero; Street: Quo virtus vocat. 6) (city of Chester, 1662). Same Arms as Wright, of Bickley, viz., Ar. two bars az. on a chief of the last three leopards’ faces of the first, a crescent for diff. Crest—A leopard’s face ar. 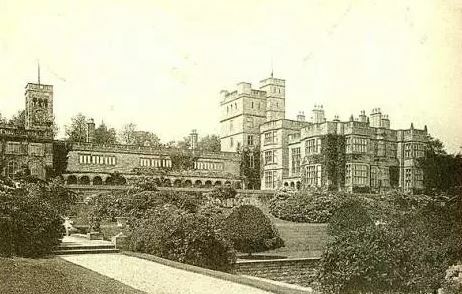 7) (Longstone Hall, co. Derby). Sa. on a chev. engr. betw. three unicorns’ heads erased or, as many spearheads az. Crest—A cubit arm vested sa. doubled ar. holding in the hand ppr. a broken spear or, headed az. 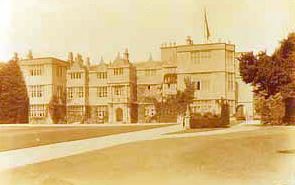 8) (Osmaston Manor, co. Derby; originally of Stowmarket, co. Suffolk). (Aldercar, co. Derby, Mollington Hall, co. Montgomery, and Swanwick, co. Derby, cadets of Wright, of Osmaston). Sa. on a chev. ar. three spearheads gu. in chief two unicorns’ heads erased of the second, armed and maned or, in base on a pile of the last issuant from tho chev. a unicorn’s head erased of the field, quartering Beresford, Halsall, and Reynolds. Crest—A unicorn’s head ar. erased rii. armed and maned or, charged upon the neck with three spearheads, one and two, also gu. Motto—Ad rem. 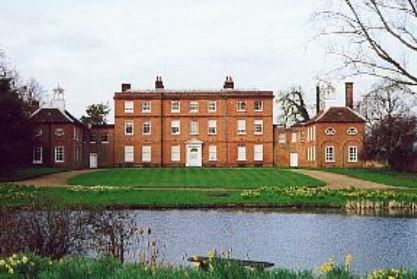 9) (Mapperley and Stapleford Hall, co. Notts. a branch of Wright, of Osmaston). (Lenton Hall, Rempston, and Upton Hall, co. Nous, cadets of Wright, of Mapperley). Sa. on a chev. ar. three spearheads gu. in chief two unicorns’ heads erased of the second, armed and maned or, in base on a pile of the last issuing from the chev. a unicorn’s head erased sa. Crest—Out of a crescent or, a unicorn’s head ar. erased gu. armed and maned gold. Motto—Ad rem. 10) (Bradbury, co. Durham). Sa. a chev. engr. betw. three fleurs-de-lis ar. on a chief of the second as many spearheads gu. Crest—A dragon’s head couped gu. semeo of crosses crosslet ar. 11) (Durham; confirmed 1615). Erminois a fess componee ar. and az. betw. three eagles’ heads of the last. Crest—An eagle’s head erminois, ducally crowned az. 12) (Sedgefield, co. Durham). Sa. a chev. engr. betw. three fleurs-de-lis ar. on a chief of the second as many spearheads gu. 13) (Bellendon, co. Essex; granted 1767). Az. two bars ar. in chief as many leopards’ faces or. Crest—A dexter arm couped and embowed, habited az. purfled or, cuffed ar. holding in the hand ppr. a sword also ppr. hilt and pommel gold, enfiled with a leopard’s face, as in the arms. 14) (Woodford, co. Essex). Erm. on a pale gu. a cross patonce ar. betw. two bezants. Crest—A garb or, environed with an antique crown sa. 15) (Dagenhams, co. Essex, bart., extinct 1681; granted 20 June, 1509). (Cranham Hall, co. Essex, bart., extinct 1703). Az. two bars ar. in chief three leopards’ faces or. Crest—Out of a ducal coronet or, a dragon’s head ppr. 16) (co. Essex). Az. two bars ar. in chief a leopard’s face or. 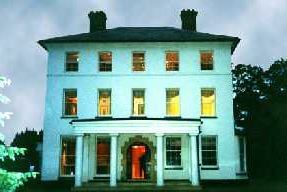 17) (Kelvedon Hall, co. Essex). Az. two bars ar. in chief a leopard’s face ppr. Crest—Upon a ducal coronet a dragon’s head and neck couped all or. 18) (Hatfield Priory, co. Essex). Az. two bars ar. in chief as many leopards’ faces or. Creat—A dexter arm couped and embowed, habited az. purfled or, cuffed ar. the hand ppr. brandishing a sword also ar. pierced through a leopard’s face, as in the arms. 19) (co. Essex). Az. two bars engr. ar. in chief three leopards’ faces or. Crest—Out of a ducal coronet or, a dragon’s head vert, collared gold. 20) (Barne, co. Hants). Or, on a chief sa. three griffins segreant of the first. Crest—Out of a ducal coronet or, an eagle displ. sa. 21) (East Mayne, co. Hants). Gu. a bend erm. betw. two martlets or. 22) (co. Hants). Az. a chev. betw. three fleurs-de-lis or, on a chief gu. as many spearheads ar. 23) (co. Hants, and London, temp. Queen Elizabeth, 1587). Gu. a bend erm. betw. two martlets or. Crest—On a mount vert a tiger pass, or, tufted and maned sa. resting the dexter paw on an escutcheon ar. 24) (co. Hants). Sa. a chev. betw. three fleurs-de-lis ar. on a chief of the second as many spearheads az. 25) (Aldington, co. Kent, and St. Edmundsbury, co. Suffolk). Or, on a chev. az. betw. three greyhounds courant sa. as many trefoils ar. Crest: A buck’s head erased or, charged with three gouttes in cross gu. Another Crest—A stag’s head erased gu. guttée d’or, attired of the last. 26) (co. Kent; granted by Segar, Garter). Per pale or and sa. a bend counterchanged. Crest—A lion’s head erased guard. or, ducally crowned sa. 27) (Edmund Wright, Esq., of Manchester, co. Lancaster). Sa. on a cross or, betw. four unicorns’ heads erased ar. armed, maned, and tufted of the second, a cross engr. gu. charged with a javelin erect, staff gold, headed of the third. Crest—A mount vert, thereon a bull’s head erased ppr. surmounted by two javelins in saltire, staves also ppr. headed ar. 28) (co. Lincoln, 1640). Ar. three martlets, a double tressure flory ar. 29) (Brattleby, co. Lincoln; granted 9 Oct. 1826). Ar. on a fess engr. betw. three eagles’ heads erased az. as many martlets of the field. Crest—On a mount vert a unicorn pass. reguard. ar. semée of estoiles az. armed, maned, and hoofed or, gorged with a collar also az. the dexter paw reposing on a cross pattée gold. 30) (Brattleby and North Kelsey, co. Lincoln; exemplified to Samuel Wright Turner, son of Rev. Samuel Turner, Rector of Nettleton, same co., by Margaret, his wife, dau. of John Wright, Esq., of Binbrooke Hall, same co. upon his assuming, by royal licence, 1863, the surname of Wright). Ar. on a fess engr. betw. three eagles’ heads erased az. as many martlets of the field, for distinction a canton of the second. Crest—Upon a mount vert a unicorn pass, reguard. ar. semée of estoiles az. armed, maned, and hoofed or, gorged with a collar also az. the dexter foot resting upon a cross pattée gold, and charged for distinction with a cross crosslet az. Motto—Quercus. 31) (London; Sir Edmund Wright, Lord Mayor of London, 1641). Az. two bars ar. in chief three leopards’ faces or. Crest—Out of a ducal coronet or, a dragon’s head ppr. 32) (London; granted 8 June, 1709). Ar. on a fess within a douhle tressure flory counterflory betw. three martlets az. as many crosses crosslet of the first. Crest—A martlet ar. gorged with a bar gemel flory counterflory az. 33) (London, cos. Northampton and Surrey, 1634). Or, on a pale gu. a cross pomée fitchée ar. on a chief az. three bezants. Crest—A falcon’s head erased ppr. 34) (Marylebone, co. Middlesex; George Wright, son of Anthony Wright, gent. Visit. Middlesex, 1663). Or, a fess az. pierced through by a pile sa. 35) (Kilverston, co. Norfolk, originally of Little Buckenham, subsequently of Weeting, co. Norfolk, and of Downham, Wangford, and Brent, co. Suffolk; Edmund Wright, Esq., of Sutton Hall, co. Suffolk, grandson of Thomas Wright, living temp. Henry Vll., m. Jane. dau. 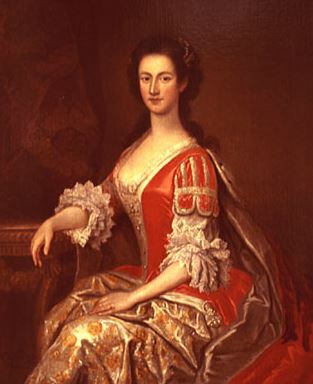 and co-heiress of Sir Thomas Russell, brother of the first Earl of Bedford, by the heiress of Jervoyse, of Sutton Hall, and had several children; the youngest son, Thomas Wright, Esq., of Wecting, was father of Thomas Wright, Esq., of Kilverstone, an estate bought from Sir Thomas Cornwallis). Sa. a chev. engr. ar. betw. three fleurs-de-lis or, on a chief of the third three spearheads az. Crest—A dragon’s head erased ar. pellettee. 36) (co. Oxford; granted 11 Feb. 1686). Ar. two bars gemel gu. on a chief az. three leopards’ faces or. Crest—A dragon’s head vert, purfled ar. scaled or, issuing out of a mural coronet chequy gold and gu. gorged on the neck with three leopards’ faces also gold, betw. two bars gemel also ar. 37) (co. Stafford). Sa. on a chev. betw. three unicorns’ heads erased or, as many spearheads gu. Creat—A cubit arm erect in coat of mail ppr. grasping a srear or, headed az. 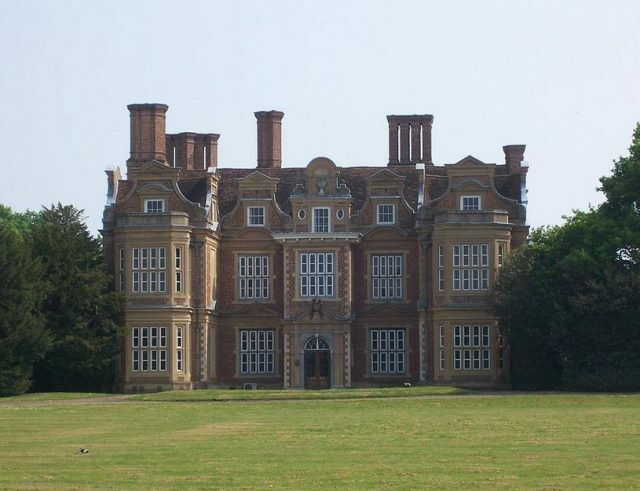 38) (Twayte, co. Suffolk). Sa. on a chev. betw. three fleurs-de-lis or, as many spearheads az. Crest—Out of a mural coronet vert a dragon’s head ar. 39) (Hartswood, co. Surrey). Gu. a fess vairé az. and erm. Crest—A camel’s head couped, bridled or. 40) (Southwark, co. Surrey). Vert three bucks’ heads cabossed or, betw. the attire of each a cross formée fitchée of the last. Crest—A lion’s head erased guard, or, ducally crowned az. 41) (co. Warwick). Ar. on a pale gu. a cross crosslet fitchée or. 42) (Bolton-upon-Swale, co. York, 1665). Or, a fess componée ar. and az. betw. three eagles’ heads erased of the last, a canton gu. Crest—A unicorn pass. reguard. ar. 43) (Botton Hall, co. York). Quarterly, 1st and 4th, az. on a fess ar. betw. three mullets or, as many eagles’ heads erased of the field, for Wright; 2nd and 3rd, paly of six ar. and erm. a wyvern gu. a chief of the first fretty of the third, for Drake. Crest—On a mount vert in front of a garb erect or, a unicorn reguard. az. the dexter forepaw resting on a mullet gold. 44) (Plowland In Holderness, co. York; John Wright, Esq., of Plowland in Holderness, m. temp. Henry IV., Alice, dau. and co-heiress of John Ryther, and was ancestor of the Rev. 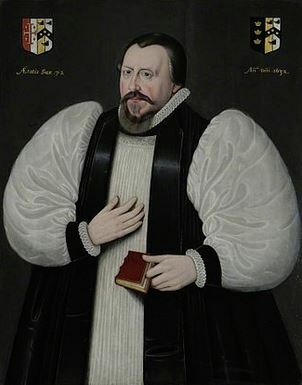 Francis Wright, D.D., who d. in 1655). Quarterly, 1st and 4th, or, a fess chequy ar. and az. betw. three eagles’ heads of the second, for Wright; 2nd and 3rd, az. three crescents or, for Ryther. Crest—A unicom pass. reguard. quarterly ar. and az. armed or. 45) (Sigglesthorne Hall, co. York). Or, a fess chequy az. and ar. betw. in chief two eagles’ heads erased and in base a feather of the second. Crest—A unicorn pass. per pale or and az. gorged with a collar gemel and holding m the mouth a feather also az. Motto—Meritez. 46) Sa. a chev. betw. three bulls’ heads ar. attired or. Crest—Out of a ducal coronet or, a bull’s head ar. attired gold. 47) Sa. a chev. ar. betw. three fleurs-de-lis or, on a chief of the second three spearheads az. Crest—A dragon’s head couped erm. 48) Sa. on a chev. ar. betw. three bulls’ heads couped of the second, armed or, as many pomeis. 49) Or, a chev. gu. in chief two mullets and in base a stork of the last. 50) (Wright-Bruce). (exemplified to Hon. 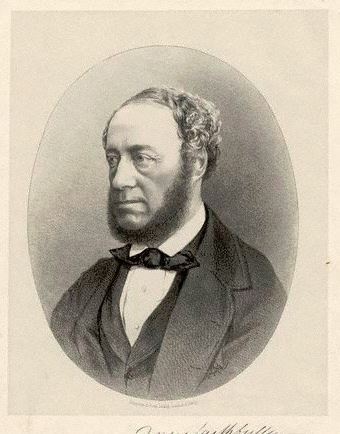 Sir Frederick William Adolphus Bruce, K.C.B., third son of Thomas, seventh Earl of Elgin and Kincardine, upon liis assuming, by royal licence, 1867, the additional surname of Wright). Quarterly, 1st and 4th, or, a saltire and chief gu. on a canton ar. a lion ramp. az. a crescent for diff., for Bruce; 2nd and 3rd, ar. three bars gemel gu. on a chief az. three leopards’ faces or, a cross crosslet sa. for diff., for Wright. Crests—1st, Bruce: A lion pass. az. ; 2nd, Wright: Out of a mural crown chequy or and gu. a dragon’s head vert, on the neck three leopards’ faces, as in the arms, betw. two bars gemel ar. above the bars gemel a cross crosslet gold for diff. Motto—Fuimus. 51) (Wright-Armstrong). 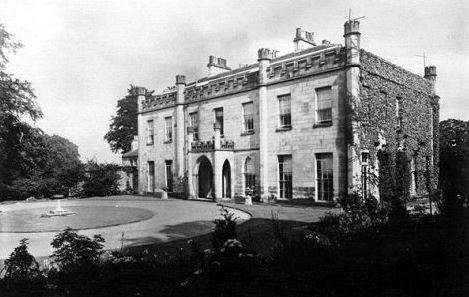 (Killylea House, co. Armagh exemplified to William Jones Armstrong, Esq., and Frances Elizabeth his wife, dau. of Major Christopher Wilson, upon their assuming the prefix surname of Wright, by royal licence, 1868). Quarterly, 1st and 4th, per pale gu. and vert three dexter armed arms couped at the shoulders and embowed, the hands clenched ppr., for Armstrong; 2nd and 3rd, ar. three bars gemel gu. on a chief az. three leopards’ faces or, a canton erm., for distinction, for Wright. Crests—1st, Armstrong: Out of a mural coronet or, an armed arm embowed, the hand grasping an oak tree eradicated ppr. ; 2nd, Wright: Out of a mural crown chequy or and gu. a dragon’s head vert, on the neck three leopards faces, as in the arms, betw. two bars gemel ar. above the bars gemel a trefoil slipped or, for distinction. Motto—Invictus maneo. 52) (the city of Dublin, and Newry, co. Down; descended from Thomas Wright, younger son of James Wright, Esq., of Gola, 1691). (Gola, co. Monaghan; senior branch extinct in the male line; descended from James Wright, who got a grant of Gola 1691; arms registered and pedigree entered Ulster’s Office). Per pale sa. and az. on a chev. betw. three unicorns’ heads couped or, as many tilting-spear- heads gu. Crest—An arm in armour embowed ppr. holding in the hand a broken tilting-spear az. headed or. Motto—Honor virtute premium. 53) (Compsey Cottage, co. Tipperary; granted by Betham, Ulster, to John Wright, Esq., of Compsey Cottage, descended maternally from Sir Richard Shee, Knt., of of Uppercourt, co. Kilkenny, and Cloran, co. Tipperary). Ar. on a pale gu. betw. two crosses moline az. an eagle displ. or. Crest—A dexter hand couped grasping a dagger piercing a leopard’s face from above all ppr. Motto—Per ardua. 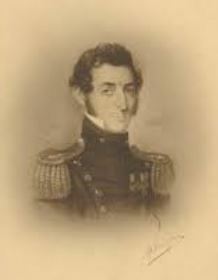 54) (Guayaquil, South America; confirmed to Thomas Charles Wright, of that place, General in the service of Columbia, second son of Joseph Wright, Esq., of Queensborough, Drogheda, and to their descendants). Per pale sa. and az. on a chev. betw. three unicorns’ heads couped or, three spearheads gu. Crest—Out of a ducal coronet or, an arm embowed in armour ppr. holding a broken tilting spear az. pointed or. Motto—Honor virtutis præmium. 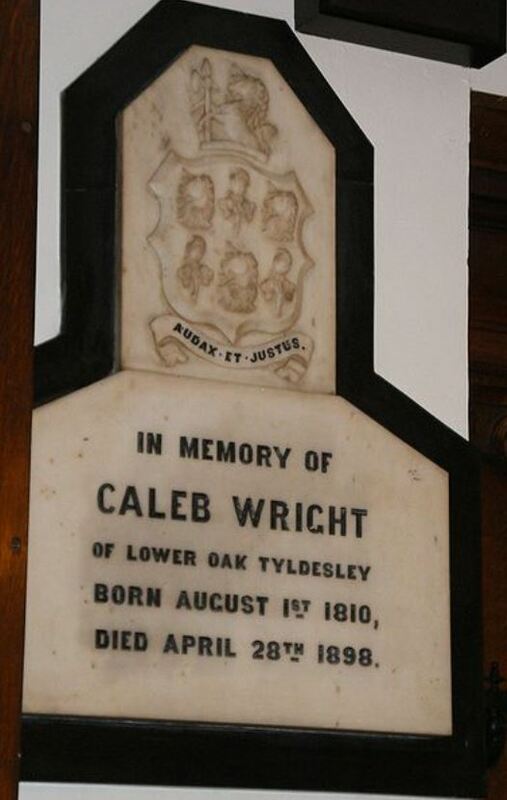 56) (Caleb Wright, Esq., of Lower Oak, Tyldesley, co. Lancaster). Per fesse az. and ar. a pale counterchanged, three unicorns, heads erased, two and one of the second, and as many sprigs of the cotton tree siipped and fructed, one and two ppr. Crest: A demi unicorn ar. gorged with a collar vair, and supporting betw. the legs a battle axe erect and proper. Motto—Audax et justus. 57) (impaled by Freake, bart. for Eliza Pudsey, dau. of Charles Wright, Esq., of St. Mary Abbots, and one of the Hon. Corps of Gentlemen at Arms, to be borne by her descendants). Or a fesse vair betw. in chief two eagles’ heads erased, and in base a portcullis az. 58) Le Wright – Per pale or and gu. a lion ramp. purp. charged on the shoulder with a cross ancree sa. The surname Wright has its origin in the countries of England and Scotland, from the people of the clan known as the Boernicians. This clan was a mix of different groups of people, which came from several cultures such as Scottish Picts, Angles, and Vikings. The Boernicians used to inhabit the northern region from Carlisle in the west to Berwick in the east. Wright is a surname that takes its meaning from an occupation; it comes from the Old English word “wyrhta”, which can be translated into current English as “worker” or more exactly “woodworker” or “carpenter.” It was originally used to refer to the people that worked with said organic material. There are rolls from medieval times, in which Wright can be found in a Latin form: Faber. This family had a seat in the region of Berwickshire, where the surname Wright appeared for the first time in official documents. One of the oldest records was about Rauf le Wrighte, a burgess from the county of Stirling, who had a spelling variation of the surname. However, the oldest record in its actual form belongs to Thomas le Wright of Blakenhall in Lanarkshire, who paid tribute to King Edward of England during his short conquest of Scotland in 1296. The coat of arms of the Wright surname is a very elaborate one, with many elements, each one offers a piece of meaning to the coat of arms. The color blue or azure, represents loyalty and truth, while the red or gules symbolize military strength. Yellow or gold represents generosity, and the black or sable is for constancy and, occasionally, grief. The chevron connotes protection and was frequently conceded to someone who was successful in a major task. The spear or pheons represent that the family is ready to serve in the military, and the unicorn symbolizes courage, virtue, and strength. Due to the mix of cultures during the medieval era, the fact that some languages didn’t have a written form, and also that surnames were written according to how they sounded, there were a lot of spelling variations of the surname Wright. This was not a strange phenomenon, as this happened to many of the last names that originated or were recorded for the first time during the medieval era. Some of the more common spelling variations of Wright are Right, Write, Wrighte, Wraight, Wraighte, Wreight and Wrate. In the case of Wright there is a particular situation which is that patronymic names derivate from it, such as Wrightson and Wrixon. Patronymic surnames were given to the son of someone based on their father’s surname, in this case, Wrightson was the surname given to the son of Wright. According to the census of 2014, the surname Wright holds the 661th position on the rank of the most common last names in the world, and it is only used by 794,330 people, which makes it a very common surname. The country where it is most prevalent is the United States, and the highest density of this surname is in Jamaica. Regarding the countries where the surname Wright is most popular, England comes in third place, followed by Australia in the 4th position. Even though today the Wright surname is not among the most common ones, it appears in some old records from England and Scotland. Most of its appearances in ancient documents are actually in the form of some spelling variation, which as mentioned above, wasn’t rare at all. Thus, we have Robert le Wriete, Roger le Wriete, and Margery le Writte in Cambridgeshire in the Hundredorum Rolls of 1273. A century later in the Yorkshire Poll Tax Rolls from 1379, there was Adam Wrygson, Robert Wreghtson, and Johannes Redebarn Wryght. Other bearers of the Wright surname or one of its variations were Robert Wricht of Shropshire in 1274 and Thomas le Wrighte of Derbyshire in 1327. 200 years later, another bearer of the Wright surname can be found in the record of the wedding between Richard Trevesse and Joan Wright on May 29, 1552, in the church of Saint Lawrence Jewry, London. There were several lines of the Wright surname that were not related to each other since they were from different times and places, and some of these lines are longer than others. Here are some of the most important ones: the first ones were the Wrights of Bolton Hall, of which Charles Booth Elmsall Wright, Esquire of Bolton Hall, was the leader. He was born on December 19, 1848, and married Edith de Cardonnel in 1870. They had 3 children: Godfrey Charles de Cardonnell, Marmaduke Nesfield, and Mary Eveline. Their lineage goes through Rev. Godfrey Wright, who had a son with his wife Mary. The child was Charles Swaine Wright, Esquire M.A. 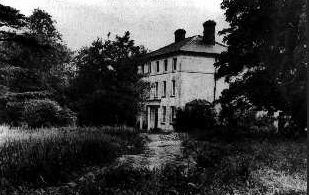 of Bolton Hall, who married Mary Ellen de Cardonnel, the eldest daughter of Colonel Elmsall. They had the following children: Charles Booth Elmsall, Marmaduke Godfrey, and Mary Dorothea. The next line corresponds to the Wrights of Kelvedon, including Edward Carrington Wright, Esquire of Kelvedon Hall in Essex. Edward was born on March 6, 1850, and married Mary Julia, the second daughter of the Honorable Henry Petre, on January 9, 1873. Edward and Mary Julia had a daughter, Beatrice Mary, on June 5, 1874. The lineage of this family starts with John Wright who bought Kelvedon in 1538 and died on October 5, 1551. Years later in 1608, his grandson John Wright, Esquire of Kelvedon, married Anne Sulyarde. John Wright got married a second time to a woman named Joane. The Wrights of Wealside, another branch of the family represented by Anthony George Wright, descended from this marriage. John Wright died in 1654, and his eldest son John Wright was the successor and became Esquire of Kelvedon. John Wright then married Frances Waldegrave in 1637 and they had three children: John, the heir, Philip in 1643, and a daughter, Frances, in 1648. Then John father died on May 31, 1656 and was succeeded by his eldest son John Wright, who became Esquire of Kelvedon and married Philippa Fitzwilliam. 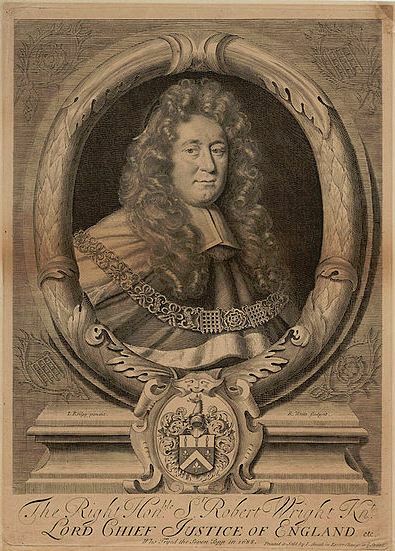 The new Esquire of Kelvedon and his wife had several children, including John, the successor; Lawrence, who died in 1737; Peter, and four daughters. John father died on October 4, 1691, and his eldest son succeeded him. John Wright son, became the new Esquire of Kelvedon and married Eugenia Trinder in 1684. They had the following children: John, the heir, in 1685; William, who died in 1737; Charles, who died in 1755, and two daughters, Anna Maria and Mary. John father died on August 27, 1731, and his eldest son took his place. So, another John Wright became Esquire of Kelvedon, and in 1714 he married Elizabeth Rooke, but she died shortly after on June 19, 1718. Then, John got married again in 1733, this time to Constantia Carrington with whom he had three children: John – his heir – and two daughters. 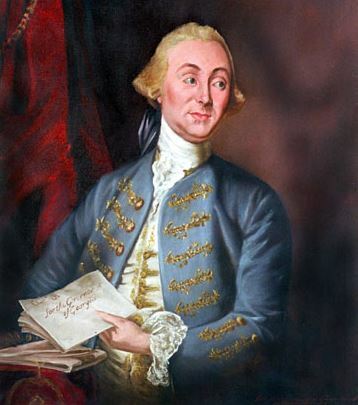 On December 2, 1751, John father died and was succeeded by his eldest and only son. His son, Esquire of Kelvedon, married Winifred Silvertop in 1762. She died on August 12, 1780, but not before having children, including an heir named John and another son named Thomas. John father got married a second time, and on this occasion he married Mary Theresa Webb on January 7, 1783, with whom he had more children: Edward (b. October 4, 1783), and two daughters, Theresa and Mary. 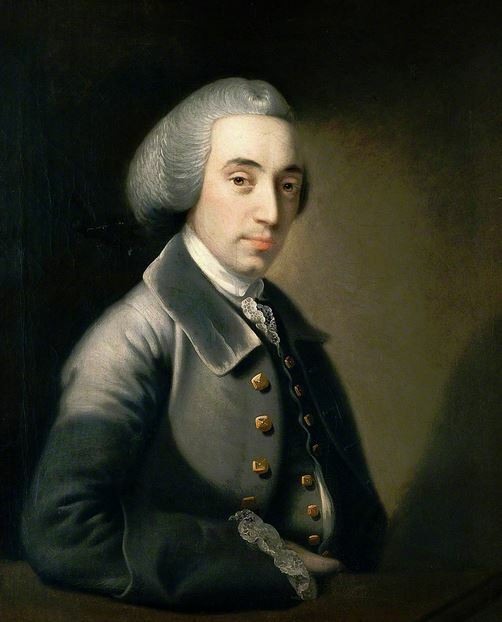 John father died on November 12, 1792, and his eldest son took over his role as Esquire of Kelvedon. Later, John Wright son married Elizabeth Lawson on January 8, 1789. They had only one son, John who was born on July 25, 1792 and married Mary Catherine Cholmeley in 1815. John son had a short life and died on December 2, 1822, and his wife died on August 27, 1858. Before their passing, they had several children. Their firstborn was John Frances, then they had Henry, who was born in 1817 and died in 1852, and finally they had Edward (b. 1818), who married Barbara Magdalen in 1849. Edward and Barbara had their own offspring: Edward Carrington, Mary Beatrice, and Madeline Mary. This line of Wrights continued until a John Francis Wright, Esquire of Kelvedon Hall, born on January 29, 1816, became High Sheriff in 1857 and died in 1868. He was succeeded by his nephew Edward Carrington Wright. When the travels from Europe to America became possible, many people from the old continent decided to go on the adventure of starting a new life in the New World. Thus, many surnames made their way to America, and Wright was among those surnames. Among the most important Wrights to first reach this continent, specifically the United States, during the 17th century were: Robert Wright, who landed in Virginia on 1623, Horten Wright, who also settled in Virginia in 1624, and Richard Wright, who got to Salem, Massachusetts in 1630 with his wife and daughter. Then, in 1635, Alice Wright got to Virginia, and in the same year, Henry Wright arrived in Dorchester, Massachusetts. Then, in the 18th century, more immigrants with the surname Wright reached the United States, some of them include Dionisius Wright, who got to Virginia in 1701, George Wright, who arrived in the Leeward Islands in 1705, and John Wright, who got to Georgia in 1732. Some years later, in 1744, Archibald Wright also arrived in Georgia, and Andrew Wright arrived in Philadelphia in 1774. During the 19th century, the Wrights kept arriving to the United States, such as Benjamin Wright, who arrived in 1806, Catherine Wright, who got to New York in 1811, Hanse Wright, who got to Tennessee in 1812, Absolom Wright, who arrived in Washington County, Pennsylvania in 1820, and Daniel Wright, who arrived in New York in 1836. Mottoes had the purpose of expressing aspects of the family, who used it as their code of conduct, to express how they saw life, their spiritual beliefs, and their loyalty to the crown. They were important because they were a way of distinguishing a family from other. 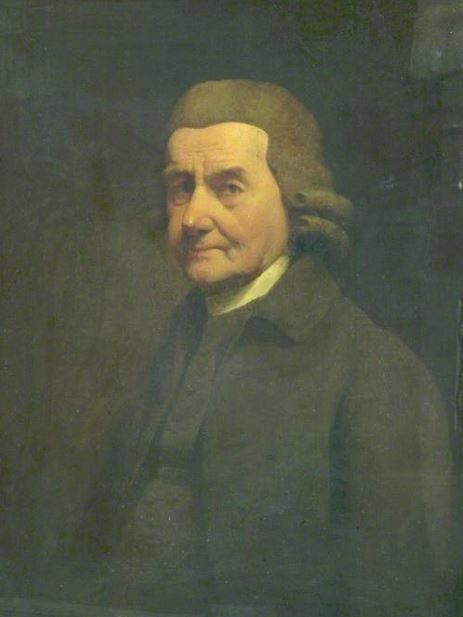 Some of the most important grantees of the surname Wright include Thomas Wright of Mile End, London in 1698; John Wright of Saint Nicholas Acons, London, and Robert Wright of Ballenden, Essex, who was Rector of Otten Belchamp during 1767. 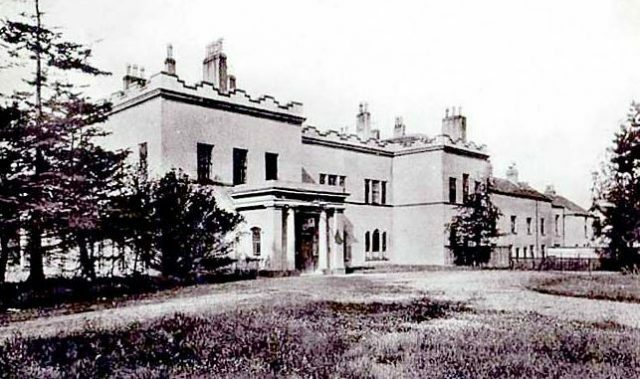 There was also Anne Wright – the wife of Robert Anderson – in 1812, Edward Wright of Trinity Hall during 1826, Edmund Wright of Manchester during 1828, Captain Edward William E. Wright of Manor Croft, and Sir William Wright from Liverpool, born on August 7, 1869. There have been several remarkable people in different areas with the surname Wright. Some of the bearers of the Wright surname that have had successful careers in their fields include: Aaron Wright, an important Australian radio personality born in 1977, the British bacteriologist Almroth Wright, and the Canadian politician Amos Wright. In other fields, there is American actress, Amy Wright, rock’n’roll singer Dale Wright (1938-2007), English film director Edgar Wright, the author of Spycatcher and former MI5 officer Peter Wright, and American golfer Mickey Wright. The main symbol in the Wright Family Crest is the leopard’s face. The leopard’s face (sometimes, incorrectly referred to as a leopard’s head occurs very frequently in heraldry. Early heraldic artists tended to treat lions and leopards as the same animal, but during the development of British Heraldry the heads of the two creatures have adopted separate, and more realistic forms. Wade would have us associate leopards with warriors, especially those who overcome “hazardous things by force and courage. In the mediaeval period there was no real percieved difference between real and mythical animals, after all, much of the world remained unknown and who was to say what strange and magical creatures existed in distant lands? Nevertheless, real animals are perhaps one of the most common sights on coats of arms, especially animals of European origin. The leopard Is a typical example of these. The second most common symboln in the Wright Coat of Arms or the Wright Family Crest is the fess or fesse. The fesse (also found as fess) is one of the major ordinaries to found in heraldry, being a bold, broad, horizontal band across the centre of the shield. It may originally have arisen from the planks of which a wooden shield can be constructed, the centremost plank being painted a different colour 505. It is instantly recognisable as a symbol, for example the arms of COLEVILLE granted during the reign of Hery III are simply or, a fesse gules. With this clear association with the construction of the shield itself, Wade believes that the fesse can be taken to be associated with the military, as a “girdle of honour”.